Political Signs Design P109 - One Click Kit. Sign stands included. Kit Includes 24x18 political signs and free stands. Easy to order kits - customize with your campaign information. Political Sign Style features full reverse with wave. These Political Signs are 24 inches Wide X 18 inches Tall - Made from long lasting, weather-proof 4-mil corrugated plastic (Coroplast). Corrugated plastic yard signs are lightweight yet extremely durable. Fluting creates a political sign that is exceptionally sturdy as well. Get more political signs for your money from SignOutfitters.com. 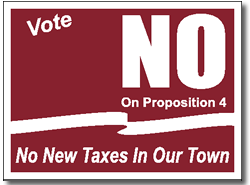 Ideas for campaign slogans can be viewed on our political slogan ideas page. Remember to observe local laws when placing your political signs with stands.